I recently picked up some Pantene Pro-V Nature Fusion shampoo and conditioner. It boasts a blend of natural ingredients, along with some unnatural ones as it is a commercial hair care product like cassia, ginger, calendula and aloe vera. Curious to know what these and other natural ingredients contribute to hair and skin products, I compiled the following quick reference (with the help of Real Simple magazine). aloe vera - Good for: As it is anti-inflammatory, it is soothing, toning, protective and moisturizing to the skin. argan oil - Good for: Quenching dryness, minimizing lines and possibly reducing oiliness. avocado - Good for: Hydrating hair and skin. May help cuts heal. 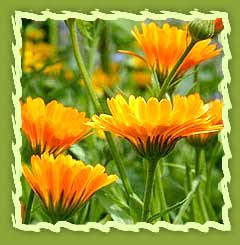 calendula - Good for: Apart from the great anti-inflammatory properties, it also has good vulnerary properties (preventing tissue degeneration while arresting bleeding in wounds), making it excellent to help with stubborn wounds, ulcers, bedsores, varicose veins, bruises, rashes, eczema etc. coconut - Good for: Making hair shinier and skin more supple. cucumber - Good for: Depuffing tired eyes and neutralizing oil without overydrying the skin. feverfew - Good for: Soothing irritation and inflammation. ginger - Good for: Added to your bath it stimulates circulation and helps remove toxins from your body. Ginger can also be added to your foot bath to soften the hard skin of your feet as well as deodorize smelly feet. grapeseed - Good for: Helping skin retain firmness. green tea - Good for: Preventing sun damage and treating blemishes. jojoba - Good for: Soothing irritation withn added to typically drying products, such as hand sanitizers and toners. licorice - Good for: Calming inflammation and helping to diminish the appearance of acne scars. olive oil - Good for: Moisturizing skin and healing sunburns. rose - Good for: Softening wrinkles. sunflower - Good for: Protecting skin and hair from sun damage. And don't forget about the list of ingredients to avoid in your commercial cosmetic products.